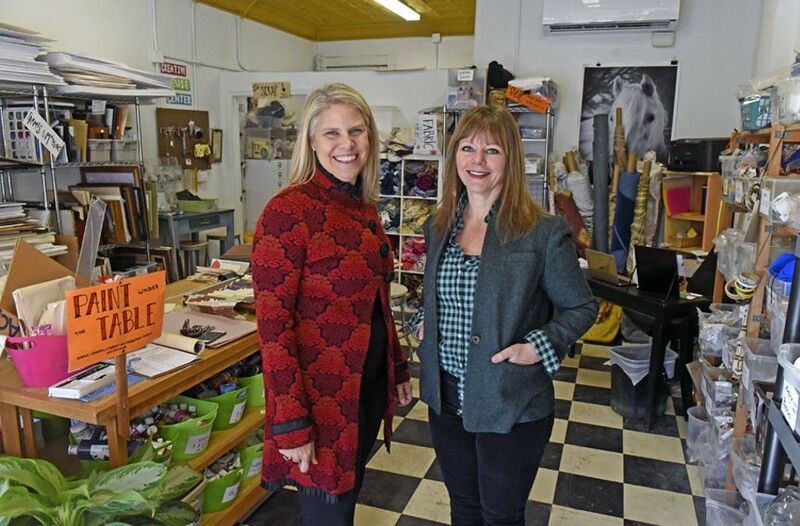 Scott Elmquist Sara Wilson McKay, chairwoman of the art education department at Virginia Commonwealth University, and Scrap RVA Director Molly Todd stand in the reuse center’s new digs at 120 W. Brookland Park Blvd. The nonprofit offers sustainable education programs and is open Tuesdays through Fridays from noon to 6 p.m. and Saturdays from 10 a.m. to 4 p.m.
120 W. Brookland Park Blvd. Making art is good for soul. Sometimes it can be pricey though, even wasteful. That's why a donation-based creative reuse store and donation center is such a good idea. Here you can find cheaper materials while promoting environmentally sustainable behavior. "We want to be known as a comfortable space to come be inspired, and as a place that gives back," director Molly Todd says. "We give back by being cheap, by doing 'crafternoons' for kids in the neighborhood, by supplying events with materials." Every penny you spend goes right back into the mission. Who knows? As you're hunting through yarn, fabric, paper of all colors and sizes, pencils, markers, scrapbooking supplies, wood, metal, plastic and vintage ephemera, you might just be inspired to take a creative turn. Like maybe a workshop on felt flowers?